What Is Hawaiian Tropic Sheer Touch Sunscreen? As per manufacturer claim, it takes a good sunscreen protection to keep your skin younger looking for longer. Give it the defense it needs to fight the cell damaging effects of unprotected UV exposure only with Hawaiian Tropic Sunscreen Sheer Touch Broad Spectrum Sun Care Sunscreen Lotion. This product, which is available in SPF 15 / 30 / 50 formulations. This sunscreen is non-greasy, non-comedogenic and dermatologically tested safe for use on all skin types. Its strength over most other sunscreens is that it is able to provide you with a broad spectrum UVA / UVB protection that assures you that your skin’s outer surface is protected from sunburn, while the deeper layers of skin are protected from the cell damaging and aging effects of UV radiation. Although customer are not happy with the results. The first-ever Hawaiian Tropic sun care formulation was mixed, bottled and distributed straight from a residential garage in 1969 by the brand’s founder, Ron Rice. His brand grew to become one of the largest global brands in sun care which captured the interest of then Banana Boat manufacturer, Playtex Products, Inc. which bought Rice’s company in 2007. Today, Hawaiian Tropic is under Energizer Holdings following a buy out of Playtex Products, Inc. Hawaiian Tropic today offers a robust line of sun care products that range from sunscreens to sun tanning lotions to after-sun care formulations. Hawaiian Tropic Sheer Touch Sunscreen – Does It Really Work? Hawaiian Tropic Sheer Touch Broad Spectrum Sun Care Sunscreen Lotion uses a complex combination of chemical and mineral sunscreens which have very different mechanisms of protecting you from the sun’s UV rays. Chemical sunscreens, which in this formulation consist of Oxybenzone and Octocrylene, absorb UV radiation and turns it into heat or breaks it down into a form that won’t cause your skin any damage. On the other hand, mineral sunscreens, like the Avobenzone included in this product, creates a physical barrier between your skin and the sun, effectively deflecting UVA and UVB rays so that these do not end up damaging your skin. The formulation is also infused with the moisturizing and high antioxidant contents of Vitamins C and E, combined with the nourishing benefits of botanical extracts. 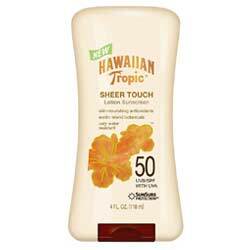 What Are The Ingredients In Hawaiian Tropic Sheer Touch Sunscreen? Cetearyl Alcohol: This ingredient works as an emollient, emulsifier, thickener and carrying agent for other ingredients contained in a cosmetic solution. Caprice Papaya (Paypaya) Fruit Extract: It moisturizes skin, clears pigmentation, reduces wrinkles & under-eye dark circles. However is may cause skin rashes. Aloe Barbadensis Leaf Juice: It reduce skin inflammation. Additionally, in Ayurvedic medicine, Aloe is used to effectively heal chronic skin problems, such as psoriasis, acne and eczema. Butyrospermum Parkii (Shea Butter): These is for soothing, nourishing and moisturizing skin so that it will return to its natural, healthy state after treatment. It also reduces skin Inflammation. Apply on all exposed areas of the skin at least 15 minutes before going out into the sun. Re-apply as often as possible. Offers broad spectrum UVA / UVB protection. Infused with strong antioxidants and deeply moisturizing ingredients. Although many user reviews say it isn’t very effective. This product may cause skin breakouts. Customer reviews state that the sunscreen is that not that effective. This product may be irritating to the eye. Does Hawaiian Tropic Sheer Touch Sunscreen Have Any Side Effects? Retinyl Palmitate (Vitamin A), which makes skin more photosensitive and therefore more prone to sun damage. Oxybenzone, which affects body processes regulated by estrogen and is highly irritating. Octocrylene, which is moderately toxic, highly irritating and found to bioaccumulate, which means that the body is unable to digest it and excrete it rather, it keeps piling up in the body. Contains PEG-8 which is highly prone to contamination with carcinogenic and toxic substances. Hawaiian Tropic Sunscreen Sheer Touch Broad Spectrum Sun Care Sunscreen Lotion gives you the full spectrum of sun protection you need to keep damaging UV rays out . Although there are many other well known brands in the market with similar effects and better ingredients and they come in a affordable range.